Mitigation strategies are the things that you can do to eliminate or reduce risk for your venture company. For every risk you list for your potential investors, you should also list your mitigation strategies. 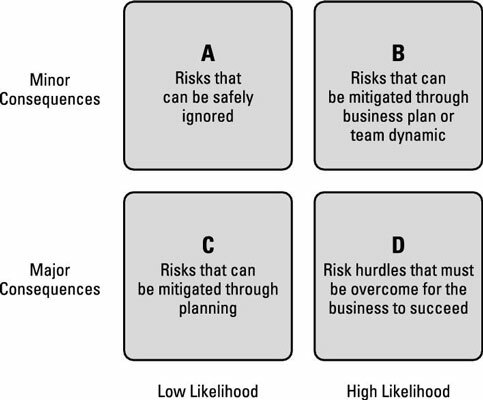 When you’re assessing risk, the overall impact is actually a calculation of the total risk, the probability of the risk occurring, and the impact of the risk minus the effects of your mitigation strategy on the likelihood or impact. Almost every risk can be mitigated, but not all risks will be mitigated. The reason is that mitigation strategies have costs attached to them. The costs may be in hard dollars, such as purchasing a key man insurance policy for all of the members of your management team, or they may have resource costs, such as the time it takes to create a strategic partnership with a company or organization that would shield you from risk. Low likelihood /major consequences (modest effort such as insurance policy). Risks are not always bad. Some risks, for example, may create barriers for entry that effectively keep your competitors out of your space, forcing them to stay out of certain market segments or avoid certain strategies. If you can develop a mitigation strategy that circumvents the risk waylaying your competitors, then you have created opportunity for yourself. Try to figure out what constraints your competitors believe they’re operating under. If you’ve also considered these constraints to be risks that should be avoided, have your team brainstorm ways that you can turn them into opportunities. If you can find an opening that you’re competitors haven’t, you’ve gained a competitive advantage. Think of how Facebook entered into a business where the network effect (a phenomenon in which a company can only be successful if a huge number of people join into the network) is a huge barrier. Everyone thought Myspace had that market locked up, so there were few competitors, but Facebook turned that barrier into an opportunity and created a huge network.